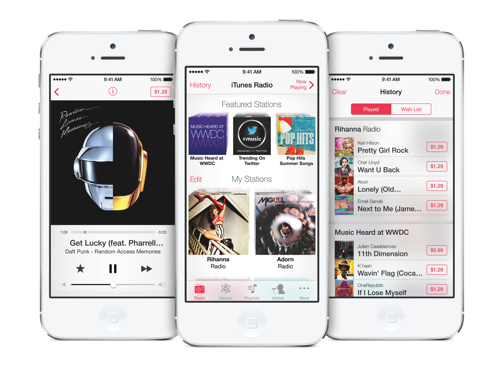 Apple announced iTunes Radio today, a new internet radio service that is built into the Music app in iOS 7. The new feature offers music discovery through featured and genre stations provided by Apple or through the creation of new stations based on a specific artist or song. iTunes Radio is an incredible way to listen to personalized radio stations which have been created just for you,” said Eddy Cue, Apple’s senior vice president of Internet Software and Services. “It’s the music you love most and the music you’re going to love, and you can easily buy it from the iTunes Store with just one click. iTunes Radio keeps track of all of the songs listened to for easy access later for purchasing or repeat listening. iTunes Radio will also be available on Mac and PC through iTunes and Apple TV. iTunes Radio will be available in the fall for free with ads while iTunes Match subscribers get an ad-free experience. The service will be available starting in the US only at first. I'm happy it's ad-free with iTunes Match. I probably will use this more than pandora or spotify radio since its integrated into the music app. Just what I think. Pointless feature. So many good quality radio apps. So many other services like last.fm or soundcloud (or even the pay for on mobile 'spotify). iTunes Radio - what's its USP? Who cares, it's free. If you don't like it, don't use it. Awesome...if you're an iTunes Match subscriber. I'm actually pretty excited about this. As an iTunes Match subscriber, I love the fact that I get the ad-free version at no extra charge. I mean, who likes having their music listening experience interrupted with ads every couple of songs? And who likes being limited to the number of tracks you can skip? And with it being available both on OS X and iOS, and the fact that iTunes is the largest digital music store, I think this makes it WAY better than Spotify, which I really liked until my free trial expired. For non-iTunes Match subscribers, you may have a point, but for those of us who do subscribe to iTunes Match, it's awesome. Ad free for only 25 bucks a year is great. But can you select songs directly for playback, or just radio/playlist mode? Great question that I hope the answer to is yes you can play songs directly. A big old MEH after all that. Also - shock horror its US only. Looked good. I like that itunes match users got thrown a bone. I loved yahoo launchcast back in the day. Look forward to trying this. Ad-free Pandora-ish music for $25 per year that is an added bonus to my existing Match services. What's not to like? This will certainly become my main music app (on my Mac - I have an Android-based phone). Pandora is $36 per year and doesn't integrate with the 10,000+ songs I have in my iTunes library. Spotify is $5 per month and $10 per month if you want mobile access. Google's music service is $8 per month and $10 per month starting in July. Yes, Spotify and Google likely give you more control over individual songs but each type of service fulfills different purposes. I don't often have time to sit down and pick songs I want to play next. Pumped. I'm already a Match subscriber.